Raja Bell was mauled. Cut off midsentence, grabbed with two long arms and almost tackled by a much-discussed man with shaggy blonde hair. Bell quickly turned around to discover the culprit. In turn, Bell found a friend. 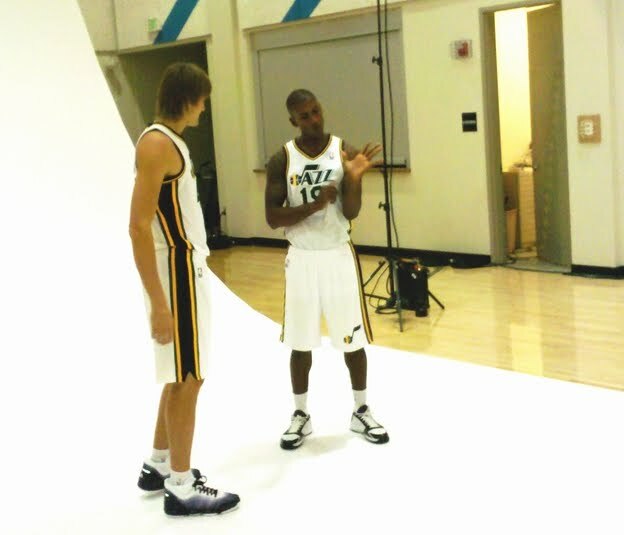 Andrei Kirilenko was saying hello. 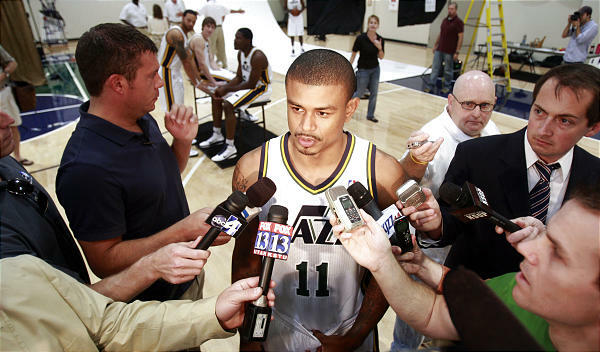 And Bell was once again a member of the Utah Jazz. –Top objective for the team: Learn each other, and get on the same page as the coaches. 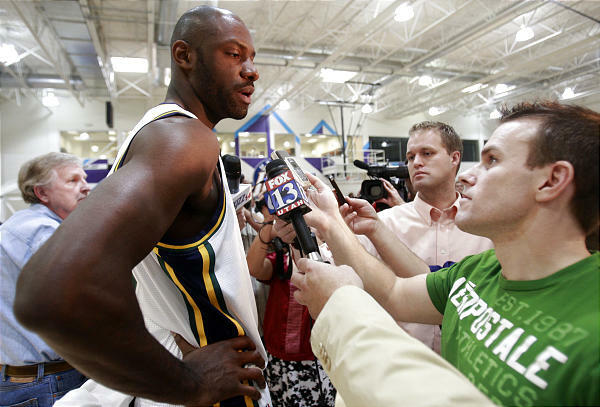 –Earl didn’t work out for the Jazz; Jazz brass flew out to see him. He was looking to join a veteran/winning team, and would have gone back to Indiana if he couldn’t sign with a Playoff team. –Had his first daughter last year. –Started the most games in UCLA history; sponsors inner city youths in Kansas City and provides them with the resources to get them to college. This is the first year his sponsored kids are in college and he’s really excited about that. –Elson grew up doing track and field, karate, playing soccer, and swimming in the Netherlands. His brother was the basketball player in the family. One day when he was 12 a guy came to pick his brother up for a basketball tournament and recruited him to play on the spot. He started playing and concentrating on basketball at 14 or 15. His dad, who was from Suriname, was a soccer player. –Elson got a little emotional talking about his brother, who suffered a fatal heart attack at the age of 21 while playing basketball. He struggled with playing basketball afterwards because it reminded him of his brother to be on the court, but when he didn’t play he missed the game too much. –He was pissed off by the heat when he first arrived in Texas. –Like Watson, he works with inner city kids to help them stay in school, especially since the financial crisis hit.